While South Fork is not precisely the center of the San Luis Valley, as far as snowmobile hobbyists are concerned, the town and the area nearby are the capital for the activity in this part of southern Colorado. 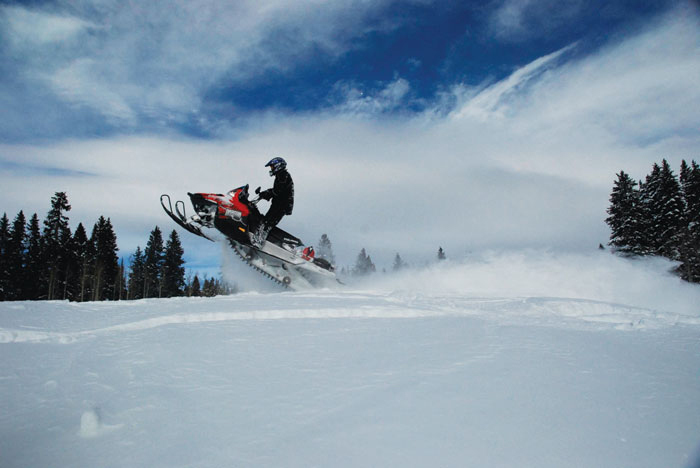 Season after season Twin Pine Motor Sports remains the San Luis Valley’s leading snowmobile rental outlet because of their superior machines and customer service. This winter, experience what you have been missing. Go for a snowmobile adventure! For more information call 719-873-9873 or visit their website. Wolf Creek Snowmobile Tours offers the best riding available near Wolf Creek Ski Area. Group, family and private tours in one, two, and three hour increments, as well as half day and full day tours are available. Ride with the Pack! For information and to book your tour, call 970-507-8703 or visit their website. The Silverthreaders Club is in South Fork Colorado and are a great resource for snowmobiling information. They can tell you where the trails are and can provide maps as well as find other people who would like to ride with you. They are hundreds of miles of groomed trails and a lot of play areas. They have organized snowmobile rides every Saturday during the winter season, conditions permitting. Meet at the Silver Thread Visitor Center parking lot before 9:00 a.m. and join them for a fun adventure. Bring lunch, water and a friend. Silver Thread Recreation Club is located at 100 Silver Thread Lane, South Fork, Colorado. For more information please call 719-873-5429 or visit their website. The South Fork Powder Busters groom 165 miles of trails during the winter for use by not only snowmobiles but cross-country skiers, snowshoe users and cross-country hikes. They also mark the trail well to help keep all riders safe. They offer weekly rides. Please call 719-873-0208 for more information and their rides schedule. Here is a little note: If you are riding the trail and there are orange or brown snow poles marking the trail on your right side your are going away from the trail head. If the poles are on your left side, you are headed towards a trail head. For those of you who are more into “Skinny Skis”, (cross country skiing) the Rio Grande National Forest offers some of the finest back country skiing to be found anywhere. Forest roads are transformed into ski and snowmobile trails in the cold months and offer an unlimited playground for the outdoor enthusiast. The forest allows free access to this pristine country. There are a number of outstanding areas for the cross country enthusiast, and with a little investigating one can find a favorite spot. For information on trails and weekly outings with the Silverthreaders, call 719-873-5429 or visit their website.